I wanted a sophisticated nursery for my son that still had a theme and something he could grow with. My jumping off point was the Serena and Lily "Graham" bedding and the yellow lab pillow! I don't have a specific style - my home is kind of all over the place. I would rather have an empty wall until I find the perfect item than force mismatched decorations. Any other stuffed animals/pillows/nicknacks were gifts or items just picked up along the way! Can I have a 3-way tie? I HAD to have the rug. I didn't want to splurge on it but it just kept nagging away at me. 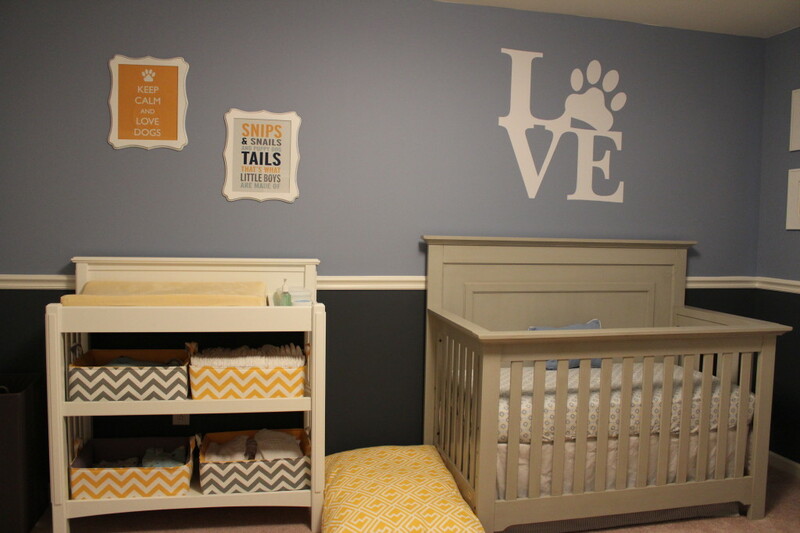 But, I LOVE the "LOVE" decal over the crib because it means something to my husband and I. And, I LOVE LOVE LOVE the yellow blanket with the 2 chevron dogs. I worked back and forth with the owner of the Etsy shop until we agreed on what would look good. Plus, it is so super soft, my son is too little to sleep with it now so I have it hanging on the hook, but I can't wait until I can cover him with that blanket and night and see him cuddling with it! Oh wait - I love the letters I put together, too! Is it fair to say I pretty much love everything?! Pick your bedding, a theme, or a color scheme, then branch off from there. I found so many items on Etsy in order to be able to get exactly what I wanted. Love all the doggy elements you managed to put here. My fave, though, is that wall decal of a boy with his dog on his wagon. Can you tell me what colors you used for the walls?? Stay at home mommy of three adorable, sweet boys. I love decorating my house and planning fabulous parties for my boys!